Made with milk and real cream, Philadelphia Garlic & Herbs has the same fresh and creamy taste as Original, but with 30% less fat and packed with delicious Garlic & Herbs. 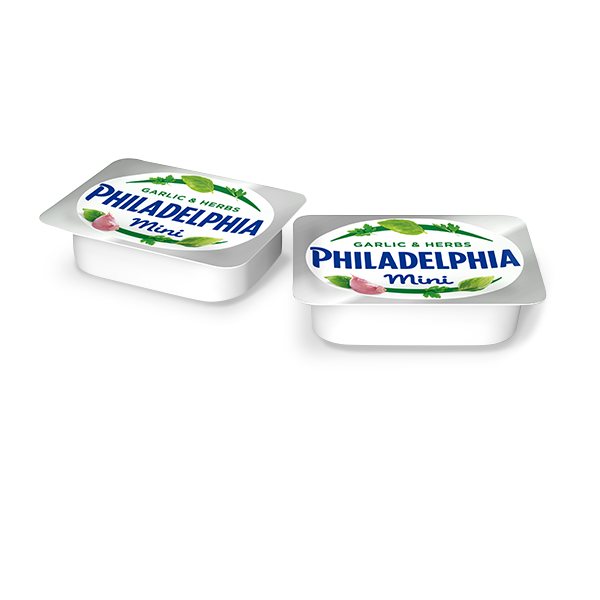 Philadelphia Garlic & Herbs Mini Tubs are a great alternative if you want to enjoy your Philadelphia at work or as a snack. Stir it into cooked bacon and mushrooms for a deliciously creamy pasta sauce, or as a flavoursome alternative to mayonnaise when building your lunchtime wraps. Philadelphia is fantastically versatile, whether you are looking for a kick to your lunch or an indulgent dinner. See our recipes for more delicious inspiration. Made with pasteurised milk and with no added preservatives. Suitable for Vegetarians. Medium Fat Soft Cheese, Salt, Stabilisers (Locust Bean Gum, Carrageenan), Acid (Citric Acid). Suitable for Vegetarians.